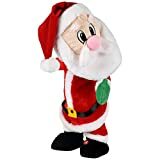 This cool new Gemmy Twerking Christmas Santa Claus is a plush animated Santa Claus that twerks his booty to the beat of the music around him, Christmas music or not, and even responds to Amazon Alexa voice commands by lip syncing the responses. Also available in a twerking Christmas bear. Check out this video to see Santa and the dancing bear bounce their behinds in a jolly old-fashioned twerk off. It not only works with Alexa, it twerks with Alexa! Plug in and turn on - Activate Bluetooth and pair - Ask Alexa! Just ask Alexa and Twerking Santa will lip sync the answer or dance to the beat.